Protests • The SLC group plans to comply with city laws during its 'occupation' of Pioneer Park. (AP Photo/Jason DeCrow) Protesters nationally have varied causes but have reserved most of their criticism for Wall Street. They've spoken out about unemployment and economic inequality, saying "we are the 99 percent" -- in contrast to the wealthiest 1 percent of Americans. 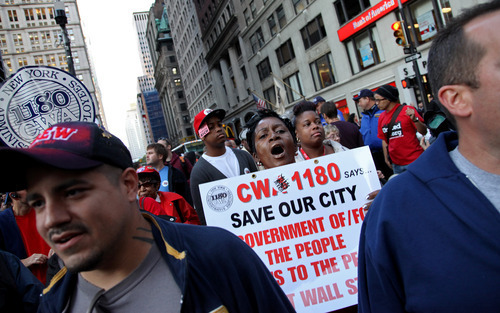 (AP Photo/Craig Ruttle) In New York Wednesday, members of a diverse group of powerful unions joined demonstrations near Wall Street, lending credibility and potentially hundreds of participants to a group that started out with a few camped-out college students. As the Occupy Wall Street protest movement and its offshoots gain strength nationwide, the Salt Lake City version is gearing up for a rally and downtown march Thursday before it sets up a base camp in Pioneer Park. In less than three weeks, the grass-roots East Coast effort  folks ticked off by corporate greed, the bad economy and a government that doesn't seem to listen  has mushroomed in size and scope. Its message has reached the Wasatch Front, where members of the loosely organized Occupy SLC have approved guidelines aimed at governing the group's upcoming "occupation" of Pioneer Park, although that act could prove problematic as it runs headlong into the city permitting process. For starters, drug and alcohol use in the camp will be strongly discouraged. No weapons will be tolerated, although multitools and pocketknives will be allowed. Inciting violence  through actions, word or tone  is also taboo. And demonstrations will not be staged in the base camp or on streets surrounding the park at 350 S. 300 West. William Rutledge says he is an Iraq war veteran who settled in Salt Lake City about two years ago. Rutledge, 30, is pursuing a second bachelor's degree in history and is actively participating in the Occupy SLC effort. "We've had 80 to 300 people at our nightly general assembly meetings," Rutledge said. Those gatherings began late last week and have been conducted from 8 p.m. to 11 p.m. in the outside amphitheater at the Salt Lake City Library. On Thursday, those sessions will shift to Pioneer Park after Thursday's 10 a.m. rally at the State Capitol and 11 a.m. march through downtown to the park. The group has no "free-expression activity" permit for the march, and although one is not required, city officials said it would be helpful. Also, a city ordinance prohibits overnight camping in parks. Rutledge said Occupy SLC is meeting with the American Civil Liberties Union and intends to stay as long as is legally possible. "There's also a city ordinance that allows people to sleep on the sidewalks as long as they don't occupy over 50 percent of the sidewalk," Rutledge said. "A park is a public place. We're not trying to circumvent the system  we feel that the law for public places circumvents us." A statement released Wednesday by Occupy SLC said that demonstrations will be staged Thursday in front of government and business offices along the march route, including at Goldman Sachs and Merrill Lynch. "We're a pretty well-educated group," Rutledge said, "and a lot of us have diverse experience." Those abilities could be put to use in medical, food, sanitation, Internet and other types of teams that would be aimed at keeping the base camp functioning smoothly if it materializes. Rutledge said the group has been preparing individually and collectively for the cooler wet weather that began hitting the state on Wednesday. Although the group's goals remain fluid, Rutledge summed up its overriding message. "The 99 percent of us that make up the lower, middle and even the lower-upper class are concerned that our voice is no longer being heard. We feel that the majority of the country has been disenfranchised and ignored  and needs to be recognized again." The Occupy Salt Lake City Facebook site exceeds 7,000 people who have joined its private group. Occupy SLC has no financial backing, other than pass-the-hat donations and personal contributions from members, Moore said. In New York on Wednesday, members of a diverse group of powerful unions joined demonstrations near Wall Street, lending credibility and potentially hundreds of participants to a group that started out with a few camped-out college students. Among them were members of the Chinatown Tenants Union and the Transit Workers Union, the liberal group MoveOn.org, and community organizations such as the Working Families Party and United NY. The Salt Lake City group's website, occupyslc.org, contains more information about the effort that sprouted from the Wall Street occupation that launched less than three weeks ago. 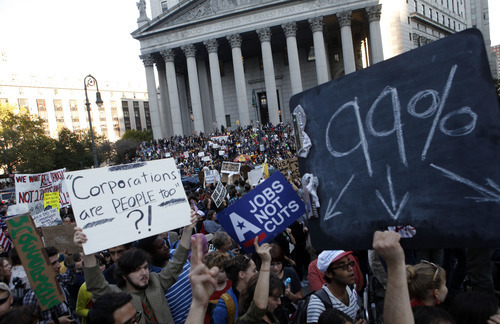 The protesters have varied causes but have reserved most of their criticism for Wall Street. 11 a.m. march • The route heads south down Main Street from the west edge of the Capitol, turns east at North Temple to City Creek Park, then heads south on State Street to 200 South. It then heads west one block to Main Street, south on Main to 400 South, then west on 400 South to Pioneer Park.